Network all of the things! Introducing VHS’s new kit, the Nanode v5. The Nanode a low-cost, Internet enabled Arduino. With a Nanode, you can easily control other remote electronics or send sensor readings via the web. Nanode can easily be connected to Pachtube, which allows you to build sensor interfaces for your browser, smartphone or iGoogle homepage. This will allow you to do such things as network RFID readers, temp seniors and build web GUI’s for your projects. The Nanode was developed by the London Hackers. It is built using all through-hole parts, so it is easy to solder and doesn’t require any experience. Previous to the Nanode, you would need to purchase both and arduino($35) and a ethernet shield ($45) to get the same capability. We will be offering this kit for the low price of $30 CAD. We currently have 10 kits available, and they can be built at the space, or at home with this picture based guide. 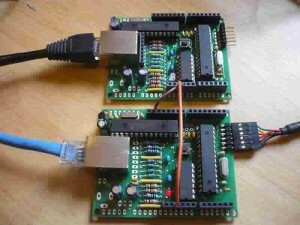 The project requires and FTDI connector in order to program the boards*. To sign up for a kit, please do so here: Nanode Kit Night v5. – We will build these kits at 7:30 on this coming Thursday, Dec 1st. Nanode is also the basis for some great projects like the open souce enegry monitor or home automation setup (like these xmas lights). Starting with this platform, we will be doing group buys for additional components and holding informative talks on how to use/expand the capabilities of this board. Additionally, wireless backpacks and add-ons are being released and we will host build nights for these in the coming months. I will also be donating a few of these Nanodes to be built into VHS infrastructure projects. *5v FTDI boards can be purchased from Lee’s electronics for $18. We will have several on-hand during the build night for people to share. We will be ordering low-cost FTDI leads in the next few weeks, along with Nanode RF Backapacks. I just ordered the Nanode Kit. This is going to be my first night at VHS.